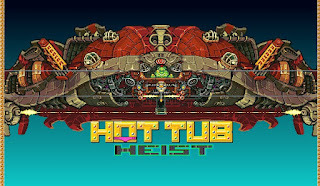 Hot Tub Heist is a new retro pixel style action game from candystand. It is called Hot Tub Heist because aliens came to destroy everything on the surface of the Earth and they starts with the building where a grooving is chilling in a hot tub on its rooftop. You play as that groovy guy and your objective is to find a shelter safe from alien beams and that is the subway. That means you have to go down but must overcome those desperate people grabbing you out of desperation - just perform a roundhouse kick them and they should get off you. Other features of this game aside from hot tubs and aliens are great pixel graphics, great sounds and a really simple yet addictive gameplay though at first you might find the controls a little too slippery but you will get the hang of it soon. Meanwhile, here is Hot Tub Heist walkthrough showing game played.